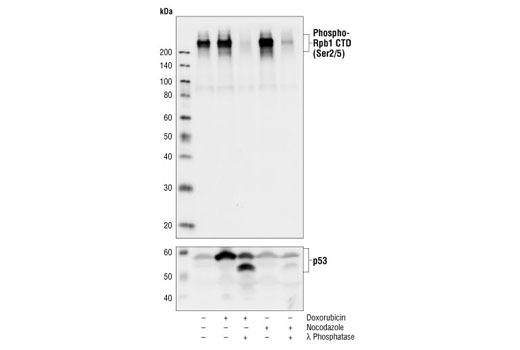 Western blot analysis of extracts from MCF-7 cells, untreated or treated with doxorubicin (0.5 μM, 36 h), doxorubicin followed by λ Phosphatase NEB#P0753 (10,000 Units/ml, 1 h), nocodazole (50 ng/ml, 36 h) or nocodazole followed by λ Phosphatase, using Phospho-Rpb1 CTD (Ser2/5) Antibody (upper) or p53 Antibody #9282 (lower). 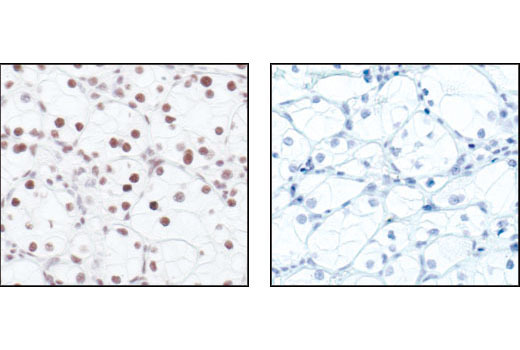 Immunohistochemical analysis of paraffin-embedded human renal cell carcinoma, untreated (left) or λ phosphatase-treated (right), using Phospho-Rpb1 CTD (Ser2/5) Antibody. 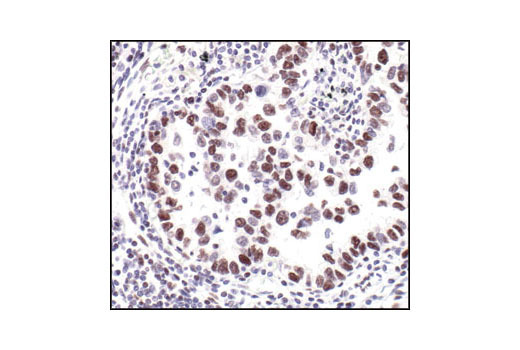 Immunohistochemical analysis of paraffin-embedded human lung carcinoma, showing nuclear localization, using Phospho-Rpb1 CTD (Ser2/5) Antibody. 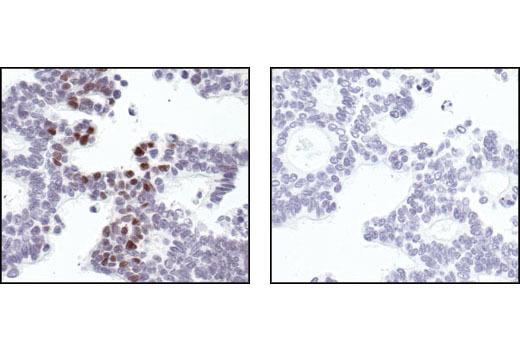 Immunohistochemical analysis of paraffin-embedded human colon carcinoma, using Phospho-Rpb1 CTD (Ser2/5) Antibody in the presence of control peptide (left) or antigen-specific peptide (right). Phospho-Rpb1 CTD (Ser2/5) Antibody detects endogenous levels of Rpb1 when the carboxy-termial domain heptapeptide repeat [Tyr1,Ser2,Pro3,Thr4,Ser5,Pro6,Ser7] is dually phosphorylated at Ser2 and Ser5 and singly phosphorylated at either Ser2 or Ser5. Polyclonal antibodies are produced by immunizing animals with a synthetic phosphopeptide corresponding to residues surrounding Ser2/5 of the Rpb1 CTD heptapeptide. Antibodies are purified by protein A and peptide affinity chromatography.